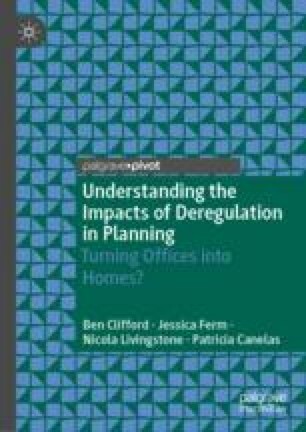 This chapter tells the story of office-to-residential change of use in Leeds. The chapter considers the general context and consequences of PD in Leeds, highlighting the issues seen there, with positives of bringing residential use into the city centre offset against issues relating to the location of some schemes on active industrial estates and the way a high proportion is not housing for residents but student and short-term rental accommodation. These issues surrounding the amount of proper housing actually being delivered are considered alongside a range of other consequences of the central government-driven deregulation locally in Leeds. Bounds, A. (2017). Prime Property Market Is Strong Within Yorkshire’s Golden Triangle. https://www.ft.com/content/d7604948-5c1e-11e7-b553-e2df1b0c3220?mhq5j=e5. Accessed 8 September 2017. Knight Frank. (2017). Private Rented Sector Update: August 2017. https://kfcontent.blob.core.windows.net/research/588/documents/en/uk-residential-investment-yield-guide-august-2017-4897.pdf. Accessed 9 September 2017. Leeds City Council. (2014). Leeds Core Strategy. https://www.leeds.gov.uk/your-council/planning/core-strategy-introduction. Accessed 29 August 2018. Mansio Suites. (2018). The Headrow. www.mansiosuites.com/aparthotels/the-headrow. Accessed 2 September 2018. Movehut. (n.d.). Meridian House. http://www.movehut.co.uk/property/227365-meridian-house-2-artist-street-leeds/. Accessed 2 September 2018. Nabarro Mcallister. (2015). Meridian House Artist Street. http://www.nabarromcallister.co.uk/dt_properties/meridian-house-artist-street/. Accessed 2 September 2018.